Yesterday, crude oil's slump from its recent dizzy heights continued for the fifth straight day. Oil traded sharply lower on both sides of the Atlantic as it followed declining gasoline prices whose production is reportedly too high for demand. As a result, US crude settled $1 lower at $103.40, although there has been some respite this morning as new tensions in the Middle East emerge. Gold and other metals climbed yesterday after the strong Chinese trade data increased hopes of demand from the world's largest metals consumer. The weakening dollar also helped push the precious metal higher which closed up $25 at $1,310. Despite oil stockpiles slipping to their lowest levels since January, crude oil futures fell for the fourth consecutive day yesterday. The contract for September delivery dropped by nearly a dollar to close at $104.69 per barrel. 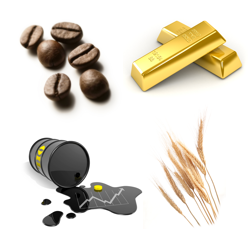 The commodity is likely to look for today's import and export data from China to provide some sense of direction. Gold's rise was generally driven by the fall of the dollar yesterday, as well as the continued correction in equity markets. The precious metal closed up 0.5% at $1,287, although this was a fairly rare up day in the current downward trend. Federal Reserve taper speculation hurt WTI yesterday, which closed down $1.25 at $105.30. A decreased money supply would hurt growth and thus the demand for energy would reduce. Concerns about the Fed reining in asset purchases hit the gold price yesterday. The precious metal fell $20 to settle at $1,282, at a three week low. The prospect of a reduction in accommodative measures means that investors favour higher-yielding assets such as equities instead of zero-yielding gold. Yesterday, WTI yo-yoed between gains and losses before settling down $0.30 at $106.25. Whilst the losses were greater before the strong services sector data, inventories are now at their lowest levels since January. The market will now look forward to later in the week when China's trade balance data is due to be released. Gold ended hovering around the $1,300 mark and is continuing on a downward trend following a strong July. Fed intentions for a tapering of stimulus hurt the precious metal on Monday and it ended down $8 at $1,296. Crude oil futures fell on Friday after weak employment data and factory orders from the US. Many had already argued that a correction was due following such a strong run which led the market to within a few cents of a 16-month high on Thursday. As a result, the price of a barrel of US crude oil closed down nearly a dollar at $106.95. Gold prices saw strong gains on Friday as the equity markets weakened, with the precious metal's safe haven appeal increasing. Earlier in the day, the gold market had suffered following some strong GDP data, but this was outdone by the rally later on, and the metal closed $5 higher at $1,307. Signs that manufacturing remains resilient in both the US and China bolstered demand for crude oil yesterday, sparking another sharp rally in WTI. Additionally, the rise of $2.54 to $107.78 might have been exacerbated by news of a shutdown for Libya's oil export terminals due to a workers protest. Whether we see tapering later this year or not, the US economy appears to be improving at every step which is bringing increasing trouble for gold bulls. This was certainly the case yesterday, with the commodity markets seeing the precious metal drop $14.8 to $1,308.3. Gold investors should be wary as the market may even retest the support level at $1,300 if today's US employment report points to a significant improvement. US crude oil posted a sharp climb of $2.16 to $105.28 yesterday after a report indicated that supplies at Cushing, Oklahoma had dropped more than 4% last week. In addition, the US economy expanded faster than predicted, which also revived demand for energies. Last but not least, crude's rally was also supported by the Fed's refusal to put a timescale on pulling the stimulus plug. Gold prices seemed to be caught between a rock and a hard place yesterday. Support was offered by hints that the $85bn/month stimulus could stay with us for longer but the US economy continued to expand, thus shifting interest from gold into equities. As a result, the precious metal ended just a few dollars lower at $1,322.5. Fresh concerns about a slowdown in US economic growth hurt WTI spread betting prices yesterday. In addition, disappointing consumer confidence figures accentuated the losses, with the market closing $1.39 down at $103.05 a barrel. Later today, the US Department of Energy will release its weekly inventories report but it seems likely that the FOMC meeting will capture a bigger audience. Although investors are becoming a bit worried about the US growth rate, they still did not go back to gold to hedge their bets as they have done in the past. On the one hand, this could mean that the concerns are simply not big enough, but, on the other hand, it proves how out of favour the precious metal currently is. All in all, the gold market lost $1.4 to $1,326.2. The WTI crude prices hardly changed yesterday, sliding just 10¢ to $104.48 despite rising unrest in the Middle East (especially Egypt and Syria). Usually the problems in the Middle East would have been a solid price supporter. This week it seems that the decisions taken by central bankers are considered far more important in the big picture. The upcoming FOMC meeting has kept gold prices in check as the exact timing of the scaling back of the massive stimulus program is still anybody's guess. Yesterday, the precious metal lost $6.3 to $1327.5 probably on indications that overall, the US economy is still expanding albeit at an unimpressive slow pace. On balance, investors continue to transfer out of gold and into better yielding assets. Speculation that China, the world's second largest consumer of crude oil, might start reducing its excess manufacturing capacity has sparked fear of lower energy demand. Consequently, US crude oil ended $0.87 down at $104.67 despite the US economy maintaining a slow recovery. After rebounding in the last three weeks from as low as $1,200, gold appears to be on a consolidation path just below the $1,350 mark. If the Fed does cut their QE, then the precious metal may see renewed weakness, however, should the economic data start to deteriorate, a test of the $1,400 level cannot be discarded.